Today, the Shield Nickel Five-Cent Coin remembers when the Reverend Ezra D. Winslow, owner of the Boston Evening News, was reported in another newspaper as being an experienced forger. The rumors and facts concerning the results of Rev. Ezra D. Winslow’s financial genius come thick and fast with every passing hour. In every quarter his operations appear to have been on the same grand scale, and his forgeries were done with the most reckless lack of attempt at concealment. Mr. Winslow was widely known in this vicinity. He was born at Whitehall, NY, September 6, 1839, and studied at the Boston Theological Seminary. In 1860, when about twenty-one years of age, he was called to a church at Phillipston, MA, where he remained about a year, leaving them under a financial cloud. From here he went to the neighboring town of South Royalston, where he preached with great acceptance for a year. Chester Factory Village was the next scene of his pastoral labors, which he left and enlisted as a private in Billy Wilson’s Zouaves. In 1861 he enlisted as private and was chaplain of the Thirty-sixth New York Volunteers, and resigned to accept the same position in the Nineteenth Massachusetts Volunteers, and was discharged for injuries, Jan. 1. 1863. The same year he was appointed chaplain in the navy, and attached to the flagship Lancaster of the Pacific squadron. It was while in the service to the Pacific coast that he first developed a mania for speculation, as when the squadron lay before San Francisco he was in the habit of going ashore and dabbling in mining and other fancy stocks, making as high as $4000 or $5000 one day and losing it the next. At the end of two years he was relieved, and ordered to report at the Charlestown Navy Yard, where he drew pay as chaplain until ordered to the navy yard at Pensacola. He retired from the service in 1869. He was subsequently connected with the Meridian Street Methodist Episcopal Church in East Boston, and also with the church in Brookline. He was one of the publishers of Zion’s Herald. In 1872 and 1873 he was a member of the House, there he was an active prohibitionist. In 1875 he represented the Fourth Middlesex District in the Senate, but failed at a re-nomination last fall. His family consists of a wife and one son, ten years old. As far as has been ascertained, Mr. Winslow’s last movement in the footsteps of Lucius W. Pond, who was yesterday sentenced to the State prison for the same offence, was in May of last year —that is to say, forgeries as far back as that have been discovered. It is generally believed, however, and there is nothing to urge against such an opinion, that his first forgeries date further back even than that. Since that time he must have negotiated paper to the amount of half a million, for there is still almost half of that in the hands of those who will lose the full amount of the face of the notes. Some of these have single endorsers and some four or five, his favorite endorser have been Mr. E. F. Porter, formerly president of the Boston Post Company, of which he was treasurer until a few days ago, and Mr. W. E. Sheldon, manager of the Evening News, of which he was the owner. It is believed that the extensive fraud on the part of Mr. Winslow was first detected last Wednesday, by Asa P. Potter, president of the Maverick National Bank. Winslow applied to him for a loan, offering certain notes as collateral. Mr. Potter made inquiries, and found that Mr. D. E. Poland, whose name Mr. Winslow offered, had not decided to endorse his note. On the same day Mr. Winslow called at the bank and informed Mr. Potter that he could not arrange his collaterals then, but would have them ready the following day. He came promptly, presented his note, incused with the name of Mr. Poland, and obtained $600. This apparent change of mind on Mr. Poland’s part surprised Mr. Potter, and he showed him the note. Mr. Poland at once pronounced his name a forgery, and Mr. Potter send for Mr. Winslow and demanded the amount of the loan. The latter agreed to pay the amount within two days, but Mr. Potter not desiring to give him an opportunity to run away, insisted on the cash at once. The result was that a messenger of the bank accompanied Mr. Winslow until he got the bills half an hour later. It was also discovered yesterday that two other gentlemen were cognizant of at least one case against Winslow. A gentleman bought his note with a good name on the back of it and going to the endorser, asked him if his name was good for the amount. “Yes, if you can get it,” was the reply. “Here it is,” said the astonished lender. The endorser promptly took the note to Mr. Winslow, who gladly compromised by repaying it as well. Two or three weeks ago Winslow said to Mr. Sheldon that he must go away and take a short vacation, he was so tired out, and should try to go on to Washington for a few days. Mr. Sheldon replied that he though he needed rest, and would advise a relief from care at least for awhile. On Monday, the 17th, Mr. Winslow again referred to his intended departure, and on Wednesday he said that he should go on to New York that night. Mr. Sheldon replied that he had it telegraphed to R. Roe & Co. about the new press they were building for them, and Mr. Winslow said he would go in and see them and have the business attended to. On that evening the New York express stopped at Auburndale, and he with his wife and son and his wife’s sister, made a passage for New York. Mr. Winslow did not return on Thursday or Friday, and on Saturday, to the amazement of Mr. Sheldon, the business manager, Mr. Porter appeared in the office, showed him a complete bill of sale of the whole establishment, and continued as in his place as business manager. Later in the day a gentleman informed him that he had his endorsement on one of Mr. Winslow’s notes of $20,000. Mr. Sheldon’s astonishment was only topped by that of the creditor when told that the endorsement was a forgery. Finding that Mr. Winslow was gone, no one knew where, he was by no means calm enough to keep his own counsel, and by Monday rumors became a certainty. So, what happened to the forger? In January, 1876, great excitement was created in New England by the discovery that the Rev. Ezra D. Winslow, of Boston, an eloquent preacher, and a great favorite in high society circles, had been forging in business transactions to the amount of several hundreds of thousands of dollars. The criminal fled to New York, and thence made his way secretly to Rotterdam, relying for his safety on the fact that no extradition treaty existed between the United States and the Netherlands. A few weeks later, however, he was found in London, where he was arrested on behalf of the United States. But the British government refused to surrender the man, without a distinct stipulation that the fugitive should not be tried for any offence except that for which he had been extradited. A long correspondence followed, during which Winslow was released on some technicality and again escaped to the continent. President Grant sent a message to Congress in June, 1876, stating the facts of the case and saying that he would not in future, without the command of Congress, take any action under the treaty of 1842. Congress did not make a movement in the matter, and the British government, a few months later, decided to recede from its position, that the treaty might again become operative. But it was not efficient enough to procure the arrest of the clerical forger. 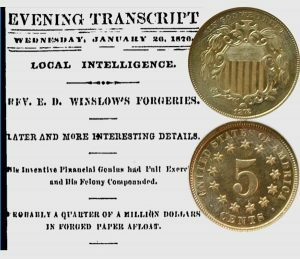 The Shield Nickel Five-Cent Coin shows with an image of the news headlines alerting everyone to the forgery crimes of Mr. E. D. Winslow.